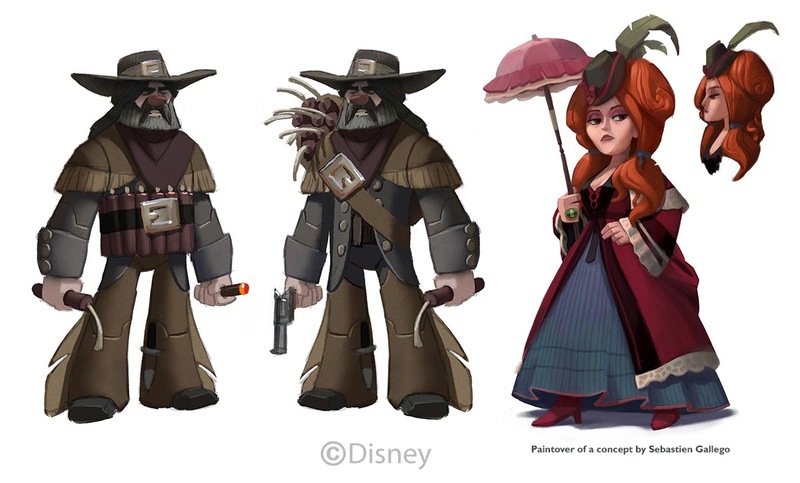 I didn't do a ton of work on the Lone Ranger, but here's some of what I did with characters. Very early in the playset we were testing whether to introduce toylike mechanics to the villains to soften the fact that you were going to be shooting a lot of people with a gun in a Disney game. They ultimately solved this problem through the sound and effects. The first version of the dynamite bandit had a cigar for lighting the dynamite (which they made me put in his hand instead), but he had to be redesigned so you could recognize him from a distance, so I did the middle version. Red Harrington a tricky problem as well because she had so much detail and patterns, and she bounced between multiple artists up until her model was finished. It's fun to see these, Sam. Keep `em coming. Those Tonto designs are fantastic! I also really love the middle dynamite bandit. Very cool. Thanks Aaron, Robert, and Scott! These are so amazing. I have an odd question, what pencils do you think work best for sketching/drawing? Anonymous: I like to use the Prismacolor Col-erase pencils. Vermillion, Tuscan Red, and Blue seem to layer in values the best. 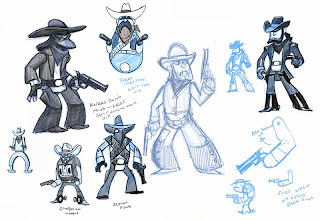 I like the big lone ranger.